If you are interested in presenting, please complete the application form (in PDF or MS WORD) and send it to us by 25 July 2014 (Friday). Successful applicants will be notified by email. Successful applicants will need to send their presentation materials by email to the conveners at least two weeks prior to the seminar. 1. Anatomy of a Riot: What questions should be asked about a riot? Which factors are salient and need to be examined? What causes a riot to erupt? What drives rioters? Are riots spontaneous or premeditated? What are the short term and long term implications of a riot? 3. Moving On: How does a society heal itself after an episode of violence? How do inter-communal relationships fare after a riot? 4. Eyewitness: Are there any eyewitnesses to the riots who would like to share their experiences? 5. 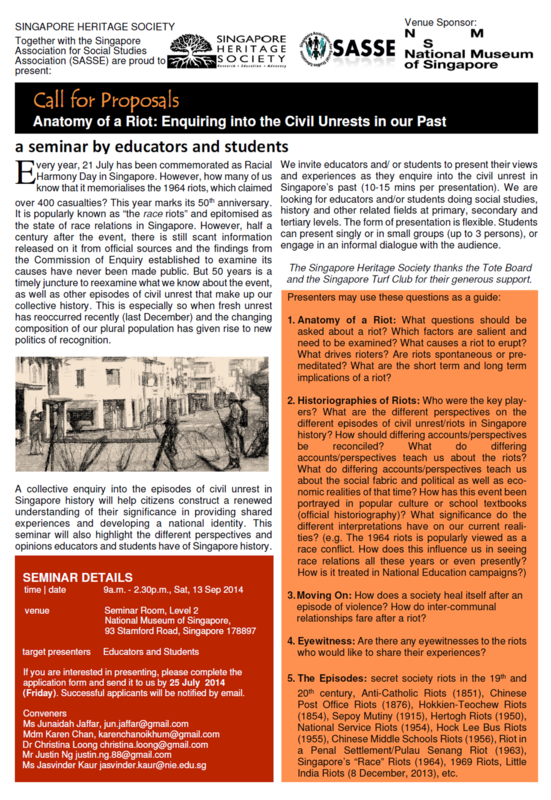 The Episodes: secret society riots in the 19th and 20th century, Anti-Catholic Riots (1851), Chinese Post Office Riots (1876), Hokkien-Teochew Riots (1854), Sepoy Mutiny (1915), Hertogh Riots (1950), National Service Riots (1954), Hock Lee Bus Riots (1955), Chinese Middle Schools Riots (1956), Riot in a Penal Settlement/Pulau Senang Riot (1963), Singapore’s “Race” Riots (1964), 1969 Riots, Little India Riot (8 December, 2013), etc.